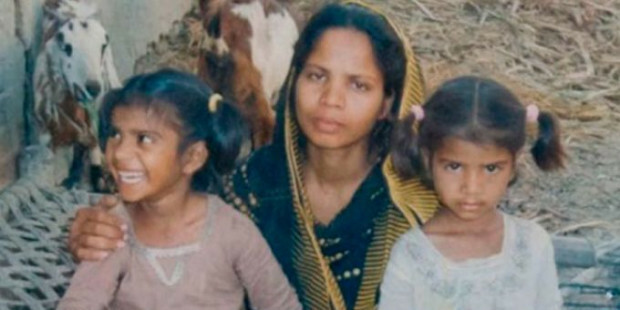 Asia Bibi, the Pakistani Christian mother who was falsely charged with blasphemy acquitted of after eight years on death row has pleaded for asylum from the UK, US or Canada. The Supreme Court overturned her conviction on Wednesday, as there was little evidence. She has yet to be released. In Pakistan, her acquittal caused violent protests; Christian schools were closed, Church services canceled and the government has now put in legislation to stop her leaving the country. On Saturday, her lawyer, Saif Mulook, fled Pakistan, saying he feared for his life. Bibi - was convicted in 2010 of insulting the Prophet Muhammad during a row with neighbours. Several countries have offered her asylum. In a video message, her husband Mr Masih said he feared for his family's safety. "I am requesting the prime minister of the UK help us and as far as possible grant us freedom," he said. He also called on Canadian and US leaders for help. Two days ago, Prime Minister Imran Khan had accused Islamic radical of offending Islam, giving the impression that he was going to take them head-on. Last night however Punjab's Justice Minister Raja Basharat, Religious Affairs Minister Noorul Haq Qadri, and TLP leader Pir Muhammad Afzal Qadri signed a five-point agreement. Under its terms, Asia Bibi’s name was added to the Exit Control List to prevent her from leaving the country. The government said it would not oppose the request for a revision of her acquittal. Please PRAY for Asia Bibi and Persecuted Christians in Pakistan! SHARE this Article and Let the World Know!